Carnaval is celebrated many different ways around the world. 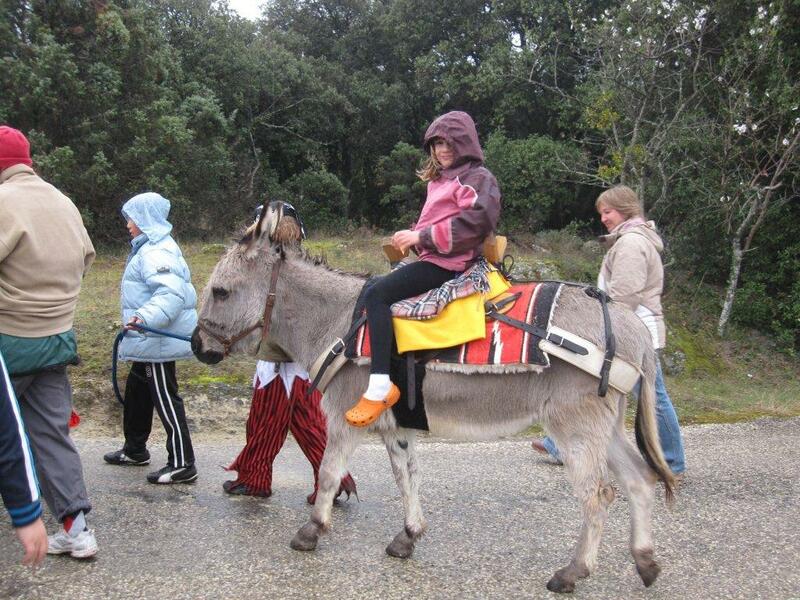 Our village throws a childrens’ festival based on Provençal tradition. It was a charming event – with a slightly barbaric twist. The day started with costumed children “trick-or-treating” around the village asking for the ingredients to make crêpes – eggs, flour, milk, and sugar. Our village was very generous so that was done quickly. 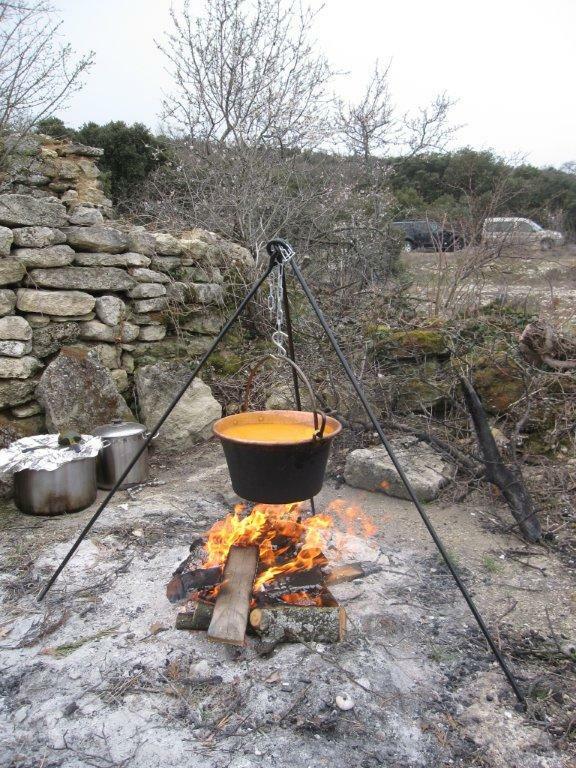 Next the entire village is invited for a lunch of soupe à la courge (squash soup) and crêpes. 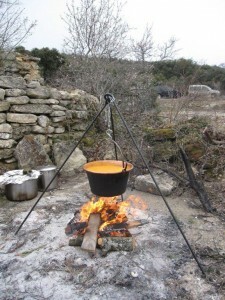 We were expecting a simple lunch, but of course it’s France so we had a feast that included sausages, nine different kinds of cheese, bread, three kinds of tartes, wine, homemade liquor made from mountain flowers, and much more. After lunch, the kids helped to make the carmentran. An old pair of pants and shirt were stuffed with straw, and a head added. The kids painted on a face, and gave him a pair of glasses. He’ was attached to a stick, and straw was piled up underneath him. Next the kids read the “accusations” where they blame the carmentran for everything bad that has happened to them during the year. This is actually quite funny. Each kid starts with “J’accuse carmentran…” The carmentran was accused of not buying cereal, breaking bikes, never letting the kids do anything, and many more heinous acts. 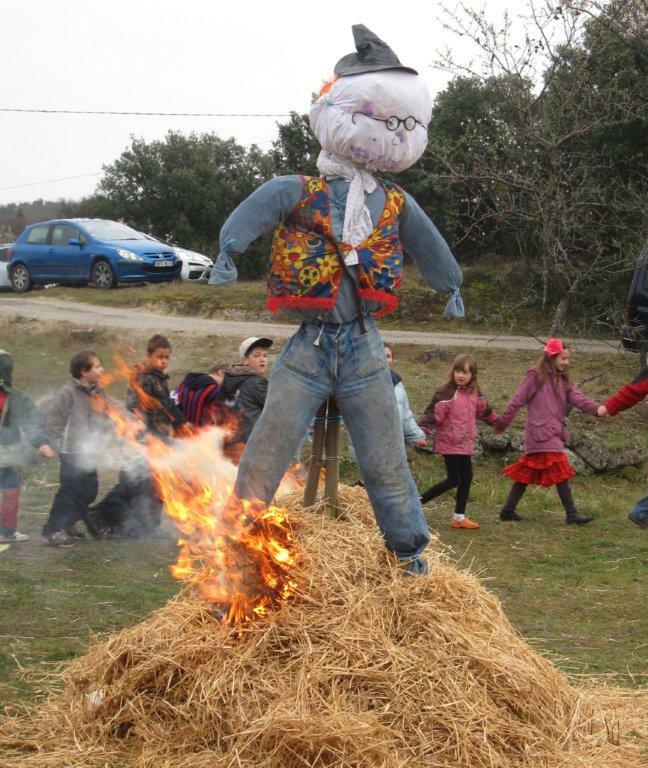 Finally, the carmentran was lit on fire, while the children danced around happily chanting “A mort carmentran! A mort carmentran!” (Death to the carmentran!). <- This was the slightly barbaric part I mentioned earlier. To finish up the afternoon, the kids took turns riding on the two donkeys that live in the village. We enjoyed spending the day hanging out in our village. The people were great, the food was excellent, the kids were amusing, and the donkeys were pedestrian-friendly in all the important ways – important since I simply cannot get into the habit of constantly scanning the ground looking for poop. I do want to embrace all aspects of our trip to France and the culture here, but I must confess that I was not completely comfortable watching my kids cheerfully demanding the death of a stuffed pair of pants. I love it! Of course the title of the post caught my attention, but I love the image of the kids accusing the stuffed pair of pants of all that has gone wrong for them this year. That’s awesome! What fun for everyone! I too like the accusations…I wouldn’t mind having a carmentran to blame my pay cut on. Your discomfort with death is because you don’t have two boys! At my house I am killed several times a day. Today I was eviscerated in my own driveway by a four-year old wielding a sharp, pointy stick. While the two-year old laughed hysterically. Evan, who is still two, is making progress in leaps and bounds with potty training. So after his bath I congratulated him on being a big boy now. And I remarked that soon he would probably not even need mommy and daddy (a leading comment, I know) … and after some consideration he said, “And then you will die?” Wishful thinking? I hope not to find out. Totally made me laugh Shirley. Always love how the kids just don’t quite get death. We visited an old church in one of the villages a few months ago, and ever since then the girls have been asking to go back. Couldn’t figure out why until we realized that there was an old tomb in the church, and they thought they’d get a glimpse of the dead guy sometime if they were lucky.